44 round brilliant cut diamonds are used in this classic line bracelet. 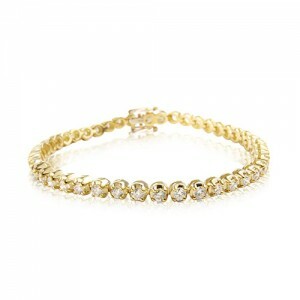 Each one is individually housed in its own four claw setting and hinged with its neighbour for extra flexibility.4 Also known as a tennis bracelet, this one is seven and a quater inches (182mm) long and made in 18ct yellow gold with a total of 5.16cts. It has a semi-concealed box clasp with double safety clips for added security.